The Keencut Excalibur 1000x features a single cutting head with 3 cutting and scoring tools ready for instant use: a utility blade, a scoring blade and a tungsten carbide cutting wheel. Excalibur provides a noiseless, dust-free and cost effective cutting solution for many of the materials used in a modern sign or graphic workshop. Turn & Lock ready tools. All three blades cut on the same line. Complete backboard set for support & convenience. Vertical & horizontal scales (Imperial and Metric). One piece squaring arm so that both left and right sides perfectly align. 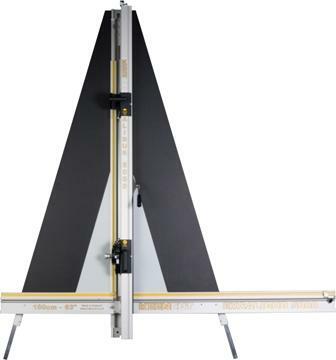 Backboard supports materials and keeps them flat & stable during cutting. Full length extra-grip clamping system. Clear Plastic Sight-line strip that accurately indicates the cut line. Telescopic legs adjust for optimal height. Two Flip Stops make cutting to size easy. Universal cutting head with automatic blade disengagement. Built-in ratchet for cutting materials to the depth required. 100 medium duty utility blades included.